Lighting: Used White Lightning mono lights with soft boxed, umbrellas and reflectors, also used a reflector card to work with the sun. For my fourth self promo assignment, I decided to photograph myself and Simon in this lovely pose. 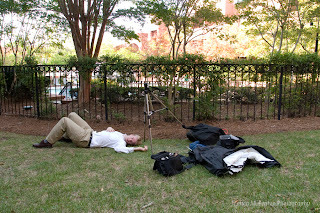 We were at a wedding in Charlotte and had two hours to do this assignment between the brunch and the wedding. I like how our clothes matched, I call it my JCrew add. This was photographed in the shade with a self timer so I could be in the picture too. 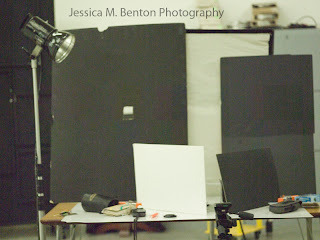 I used an on camera flash with the white part of a soft box taped over the light in order to get a soft diffused light. This I believe is the last moth of the year! A few nights ago there were so many moths displaying their fabulous colors under the light of my front porch, so I decided that I was going to photograph one. The next night I set up for three hours in the nearby field with a white sheet a inviting lights and no moths were in sight. It had just gotten cold and the moths were dead I think. After a day of photographic dispair, I woke the next morning to see my cat chasing a moth inside my house. This moth had survived by coming into the warmth. I set up my lights in the house as you can see here and photographed the moth against a white background. 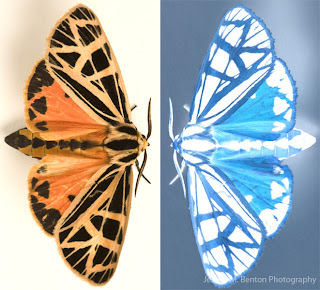 In Photoshop I inverted the image to make a digital negative and put the two images side by side as you see here. The last moth of the year in all of its glory! These portraits of Layne (red hair) and Katie were taken for an assingment. 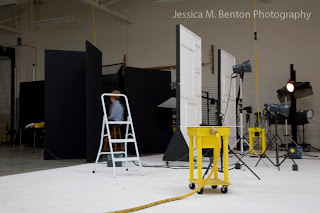 Our goal was to photograph individuals against a clean white background without flare. You can see how this shot was setup above. I photographed Layne first, she is in her first year at RCC and is an amazing model. Her energy made this project fun. I allowed the white background to go gray in this photograph which cannot be seen here due to my cropping. Therefore I reshot this assignment with a new model. Katie (blonde hair) was aso a wonderful model. I managed to create a clean white background this time which you can see because I put the full frame here. This assignment was the first time I tried to work with models I had just met in this sort of posed setting. The third client assignment required taking a cover photograph of something that symbolically illustrates a book called Us and Them: A History of Intolerance in America. The book cover also had to be appropriate for high school students. 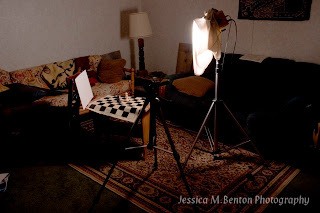 After losing sleep over what to photograph, I chose to photograph a chess board. 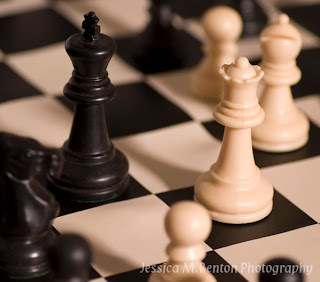 I think the positioning of the pieces on the board, as related to this symbolism, displays tension, strategy, competition, and togetherness of race and gender relations. My goal is that the audience will read into the image as far as they wish. I captured this image at home using an alien bee mono light (with a shirt used as a diffusion screen) and a reflector card (held up by a kitchen chair). On rainy days in the Southern Appalachians, these little salamanders, Notophthalmus viridescens, came out onto the trail. Luckily they were bright or else I would have stepped on them. 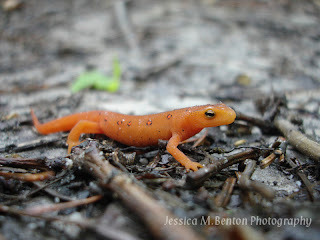 This salamander is in its juvenile red eft form. 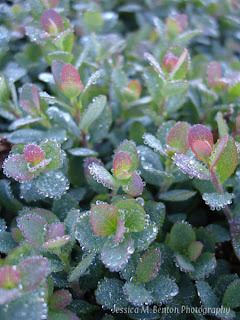 I photographed these plants that are displaying guttation in the above tree line alpine zone of the White Mountains of New Hampshire. I love how the colors complement each other so well. This is the first self promotional assignment for my commercial program. I decided to try to mimic David Liittschwager and Susan Middleton's style of photography. 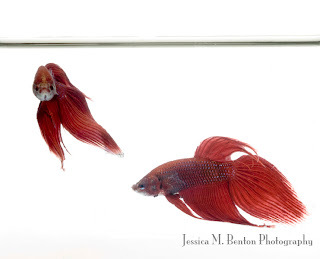 To get the clean white background, I placed a soft box behind the fish. 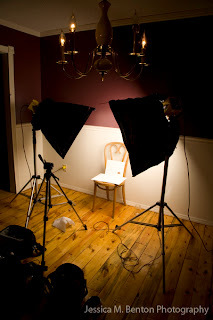 The picture below shows how I initially set up the lighting. For the final picture, I added another soft box above the fish on the left and a strobe with a reflector above the fish on the right. These light illuminated the front of the fish. I also added more black cards around the fish to reduce glare. The final image is a composite of three images. (There actually was only one fish.) Being able to photograph a subject like this was what prompted me to come to school in the first place. I am excited that I was able to create this image. Now I have to improve upon what I have learned. 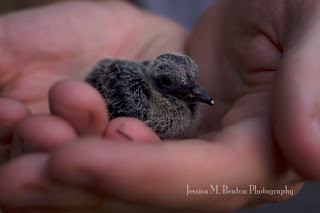 This little bird fell from a tree in my parent's backyard. I had my boyfriend hold it while I took its picture. We tried to place it in a safe place in hopes that its mother would come feed it, but at the end of the weekend I found it dead. Nature is beautiful and harsh. I like how this photograph shows the details of the birds undeveloped feathers. It is amazing how deep black its eyes are.